Crystal Torres enjoy a new friendship formed through their time in the program. 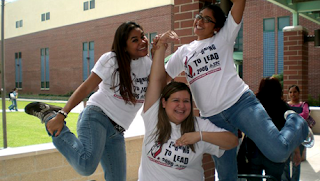 South Texas College is looking for participants for its Learning to Lead Program, which includes a series of free, interactive workshops focused on cultivating the leadership abilities and communication skills of area high schoolers. The program will kick off Thursday, July 8 at 6 p.m. and will run every Tuesday and Thursday throughout the month of July, with a graduation ceremony on August 3. The workshops will be held at the college’s Pecan Campus located at 3101 West Pecan Blvd. in McAllen. Participants will receive lunch and snacks, as well as a free gift. The college’s Department of Student Life will lead the workshops, and will be joined by leaders presenting on emotional intelligence, dealing with conflict, navigating the road to college, as well as many other engaging topics. The workshops promise to be highly interactive, allowing participants to put into practice lessons and theories learned. There are no prerequisites for participation, except being an entering high school junior or senior in Hidalgo and Starr counties. “The program is a great way to enhance some of life’s most important skills, as well as start building a foundation and social network that will sure be part of a summer you will always remember,” added Ponce. For more information about the free program contact Ponce at 956-872-2515 or at aponce@southtexascollege.edu.